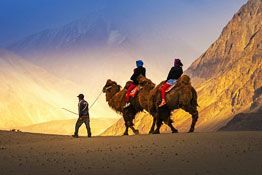 A complete tour package to Leh Ladakh, Our meticulously crafted “Air Package from Delhi to Sri Nagar and Leh” takes you from Mughal Gardens and enchanting Dal Lake in Kashmir to the high mountain passes, high altitude lakes and sand dunes of Leh Ladakh. 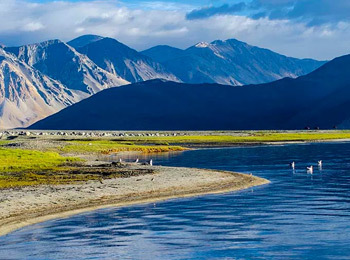 This complete Leh Ladakh air package includes best of everything that Ladakh has to offer. 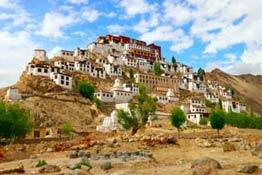 We are proud to say that this Leh Ladakh tour package is exclusively available through us. Air Package from Delhi to Sri Nagar and Leh begins from Delhi and the fist destination is Kashmir. Fondly referred to as the paradise on earth, Kashmir Valley is renowned across the globe for its mesmerizing Mughal Garden lush surroundings and unparalleled splendor of Dal Lake with its floating markets, colonial houseboats and shikara rides. 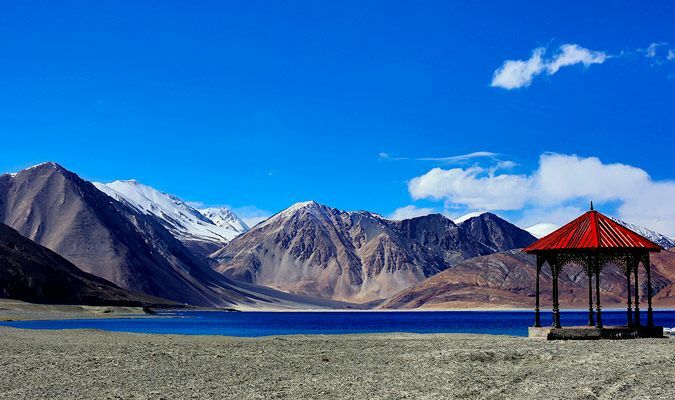 After exploring the splendor of Kashmir Valley, Air Package from Delhi to Sri Nagar and Leh will take you to Ladakh for “the Little Tibet Experience”. 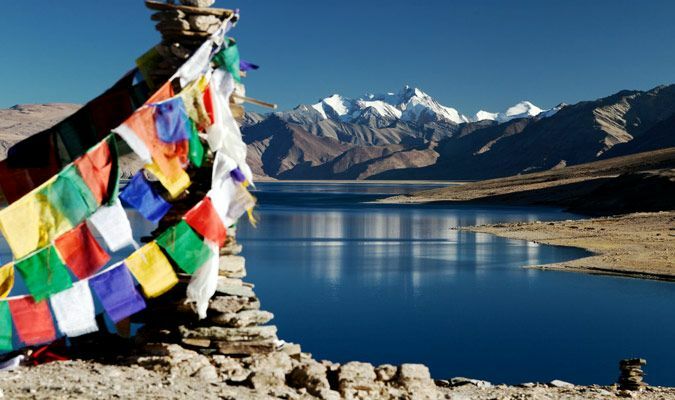 Explore the monasteries to get a peek into the Tibetan Buddhism which has a great influence in lifestyle and culture of this region, visit Pangong Lake, and Tso Moriri offering spectacular sights and then head to the ‘Desert in the sky’ for an unforgettable holiday in one of the most awesome tourist places in India. What are you waiting for? Book your Ladakh trip today…We are sitting by the phone! Take the morning flight to Srinagar. Upon you're arrival you'll be received and transfer to Deluxe Houseboat at Dal Lake by our representative to relax and spend overnight. Optionally you may choose to go for Sikara ride in the lake which sprawls across 18 square kilometers area. The houseboats in Dal Lake come with well-furnished rooms, terraces, and verandas with separate smaller boat forming the kitchen. 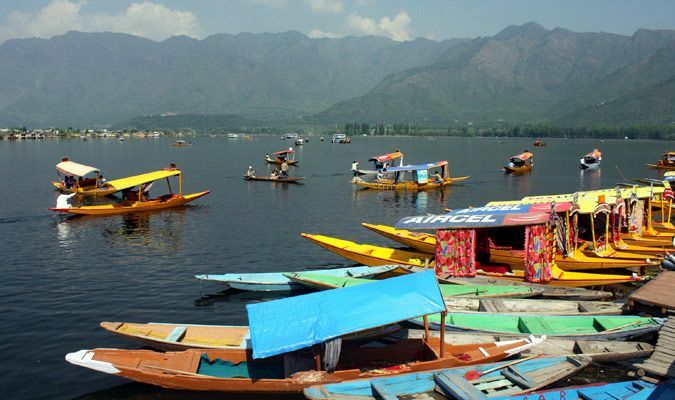 In Srinagar, Dal Lake is almost an entire city on the water. Accommodation is available in British style houseboats which are moored on the side of the lake. For transportation there are shikaras and even full-fledged markets and floating shops and you'd be amazed to find out that the vegetable and fruits sold on the shikaras are grown in the floating fields and gardens on Dal Lake itself. After a leisurely breakfast, embark on a sightseeing tour of the Mughal Gardens. One of the most spectacular Mughal Gardens in Kashmir is Nishat Bagh. It was built by Asaf Khan, the brother- in-law of Emperor Jehangir in 1632 A.D. Located on the bank of the Dal Lake, with the Zabarwan Mountains as its backdrop, Nishat Bagh is a broad terraced garden with central canal cascading through the center from the top of mountain to the Dal Lake at the bottom. The garden is lined with boulevard of chinar and cypress trees. In total there are 12 terraces with each representing a sign of Zodiac. Shalimar Bagh was built by Jehangir for his wife Empress Nur Jahan. It is the largest Mughal Garden in Kashmir and is considered to be the supreme example of Mughal Horticultural skills. The Shalimar Bagh is well known for arched niches (chini khanas) which give it an enchanting touch to the waterfalls. All the gardens are situated on the banks of the Dal Lake with the Zabarwan hills in the background. To get a glimpse into the local art, you'll be visiting a carpet weaving factory. Return to your houseboat for Lunch. Afternoon is at your own leisure. Spend the night in the houseboat. After an unhurried breakfast in your houseboat, head to full day tour of Gulmarg. Gulmarg which translates to the "meadow of flowers" is located at an elevation of 2730 meters above the sea level. Gulmarg has one of the highest golf courses in the world with 18 holes. You can also enjoy a view of Nanga Parbat if the weather permits. The view en route from Tangmarg to Gulmarg is fascinating. Tanmarg is a main destination for skiers riding down from Gulmarg during the winter months. 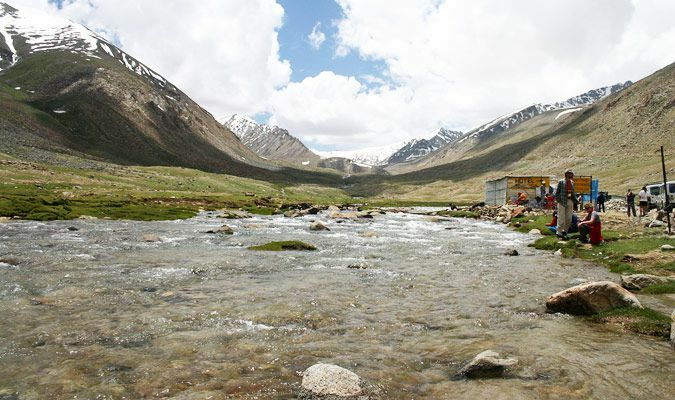 Optionally you may choose a short trek up to Khilanmarg, which can be covered in about 3 hours. 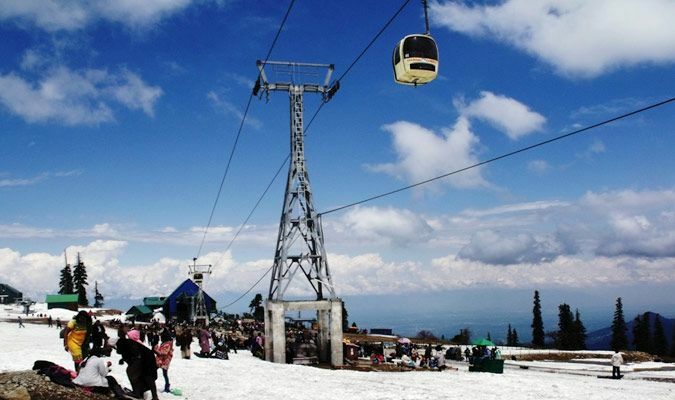 In Gulmarg, gondola ride is also available. Your lunch will be arranged in a hotel in Gulmarg. Return to your houseboat in Dal Lake for dinner and overnight stay. In the morning, you'll be assisted in smooth transfer to the airport to board the flight to Leh. You will be received on arrival and transferred to your hotel in Leh. Rest and acclimatize yourself to the altitude and rarified air of Ladakh. Leh is located at an altitude of over 10,000 feet (3,450 meters). Acclimatization is one of the most important things to consider while traveling to Leh. You need atleast 2 days to acclimatize to high altitude and low oxygen air condition in Leh to avoid AMS. 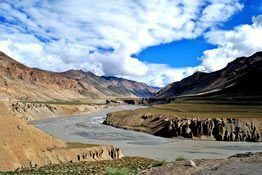 Know more about acclimatization in Leh Ladakh. You can always visit monasteries and palaces nearby during your second day of acclimatization. After breakfast, transfer to Uleytokpo. 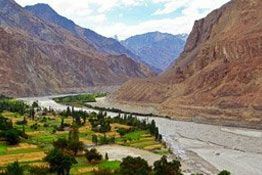 On the route we'll take a short detour and visit village of Nimoo and stop for photo session at the confluence of Indus and Zanskar River. After the short photo session, we'd proceed to Basgo Fort and Likir. Basgo known for its castle ruin and gompa with Maitreya Buddha and murals is dramatically located on the rocks. There are several original wall murals which have withstood the ravages of time. Below the forts and temples are the small pretty villages. 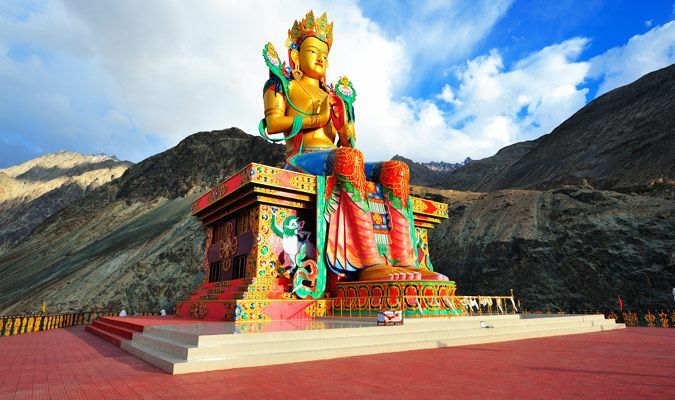 Situated 5 kilometers from the main Leh - Srinagar Highway 52 kilometers from Leh is Likir; known for its monastery which belongs to the GeLugPa sect of Tibetan Buddhism. Perched magnificently on a small hillock in the Indus Valley, Likir Monastery is one of the most impressive spiritual destinations in Ladakh today with great trekking options for visitors and an unperturbed meditational ground. Later arrive and check-in at Uleytokpo Camp. After rest, we'll drive to Alchi Gompa which is 9 Kms from Uleytokpo. Alchi Monastery os considered one of the most beautiful Gompa of Ladakh. Considered one of the most well preserved Buddhist centers of Ladakh, the Alchi monastery has beautiful paintings on its walls, which are examples of early Buddhist art. Its Murals dating from 11th and 12th centuries, pre-date the Tibetan style of painting that is present in all other Gompas. Return to your camp for stay overnight in Uleytokpo. In the early morning, we'll visit Rizong Monastery. Return to camp for breakfast. Depart for Leh, en route visiting Phyang Monastery (17 kms from Leh), which was built by Tashi Namgyal in 16th century AD and belongs to the Red Cap Sect of Buddhists. Have an early lunch and continue to Leh. On arrival, check into hotel and spend the day at leisure. In the evening you can walk around and visit the markets in Leh, where you can buy Ladakhi craft items from the friendly local people and Tibetan Markets. In the morning, we'll leave for Pangong Tso Lake. En route we'll stopover to visit Shey Monastery. On our journey towards Pangong Tso, we'd cross Chang La, one of the most scenic mountain passes in Ladakh. 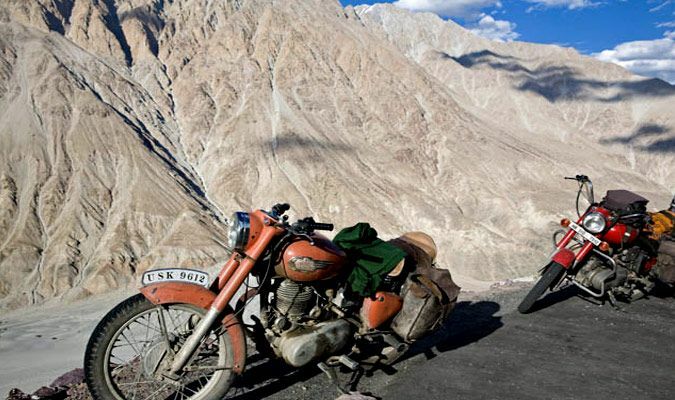 It is also the second highest in the region after Khardung La if the modern readings are to be believed. At the top we'll stop over for refreshments for a few minutes. Afterwards, we'd continue our drive to Pangong with next stopover at Tangtse Village where passports and inner line permits are checked. After drive of a few hours, we'd arrive in Pangong. Pangong Tso is the most popular tourist place in India. The salty water lake spreads all the way to China. You'll be checked into a luxury camp in Spangmik. After refreshment, we'll spend the evening exploring the majestic Pangong Lake. Pangong Lake is ensconced in the Greater Himalaya at an altitude of 4,350 m (13,900 ft). Its scenic beauty and breathtaking surroundings attracts tourist from all around the globe when the road opens to Pangong after April/May. We'll also visit the famous 3 Idiots Point where the the climax scene of Aamir Khan and Karrena Kapoor starrer super hit Bollywood movie 3 Idiots was cinematographed. After exploring Pangong which is located very close to Pangong Lake for your overnight stay. In the morning watch the mesmerizing view of sunrise over the lake and the barren mountains which appear golden due to sun rays. After breakfast, we'll leave for Leh. Leave in the morning and drive to Tso Moriri. Stop at Upshi for passport checking. En-route visit Chumathang which is famous for medical hot spring. Also visit Sumdah village on the way and continue drive to Tso Moriri Lake which is breeding grounds for numerous species of birds. Tso Moriri is one of the famous lakes in Ladakh in the Changthang plateau in Jammu and Kashmir. The lake is at an altitude of 15,075 feet (4,595 meters) and the largest high altitude lakes in Trans Himalayan region entirely within India. Expect to see Tibetan wild asses, Marmots and other endemic species. Tso Moriri is also home to over 34 species of avifauna which include 6 endangered species. The sunset at Tso Moriri offers awe inspiring view and is perfect for photography. One should not miss sunset at Tso Moriri. After dinner, spend overnight in camp in the vicinity of the lake. 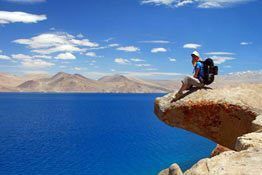 After morning breakfast, we'd explore the surroundings of Tso Moriri Lake and you could do some photo shoot to take back the memory of this beautiful place in pictures. Later, we'd proceed to Korzok village in the morning with its houses and its gompa appearing like a mirage. The few barley fields at Korzok must be among the highest cultivation in the world. We'd then head towards Leh. The ride from here is spellbinding as the landscape keeps changing its color. Yellow hued barren hills change their color from orange to pinkish purple. Then you will also come across land with sparse vegetation and flowers which look breathtaking in the circumstances. On our return journey we will visit Thikse Monastery, one of the most spectacular Gomapas in Ladakh if the time permits it. Dinner and overnight stay will be arranged in a hotel in Leh. After refreshment and breakfast, we'd leave for Nubra Valley today which lies on the ancient caravan trade route or the silk route. En route we'll stop over for a few minutes at Khardung La which is the world's highest motorable pass if the signboard at the top is to be believed. After having some tea and snack, we'' move on towards Nubra Valley and arrive in Diskit. In Diskit place of interest where we'll visit is the ancient Diskit Gompa built in 1420AD. Nestled atop a hill overlooking the small oasis that is Diskit, the Gompa offers breathtaking panoramic views. Later we'' move on to Hunder, a small village amidst fields of rye and barley and surrounded by fruit orchids and sand dunes. It is here that we'd make arrangement for our night stay in camps. Today we'll explore the famous sand dunes of Hunder also known as 'desert in the sky'. You can do camel safari in the sand dunes of Hunder over double-humped Bactrian camels. These are the relics of the days of silk route trade. In those days of caravan trade, double-humped Bactrian camels were the main mode of transport on the Ladakh-Yarkhand (Turkmenistan) in Central Asia trade route. Later we'll move towards Sumur which is a scenic little oasis in the semi arid high altitude desert of Nubra Valley. Here we'll visit the 150 year old Samstening Gompa before moving on to Panamik. 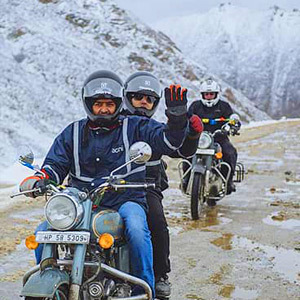 Panamik is the last point in Ladakh where civilians are allowed on the road towards Siachen Glacier. One a bright day you could catch a glimpse of the highest battlefield in the world from here. There are a few hot water springs too in Panamik. Here we will visit Ensa Gompa. Tonight we'll stay in a guest house or return to Diskit for stay in a hotel. In the morning after refreshments and a leisurely breakfast, we'll head back to Leh retracing our steps on the ancient silk route. Upon arrival in Leh we will go visit the Shanti Stupa, a Japanese Pagoda enshrined by his holiness Dalai Lama itself. Perched atop a hillock, Shanti Stupa offers panoramic view of the Leh Town and offers best photo ops for shooting. Another tourist places to visit today are the Leh Palace and Jama Masjid. Today is the reserved day to accommodate for uncertain weather conditions or road blocks which might cause delay. After early breakfast, you will be transferred to the airport in Leh for your flight to Delhi. Continue your journey of incredible India or fly back home.